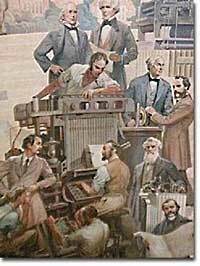 This detail of a mural in the foyer of the Poughkeepsie Journal, shows Ottmar Mergenthaler at his linotype machine surrounded by Morse, Bell, Edison, Greeley and others who played important roles in publishing history. The Linotype machine, invented in 1883, allowed for much faster printing of many more papers. The market was there. The technology was there. All that was necessary was a group of entrepreneurs bold enough to seize the opportunity. The result was an American revolution in print. Anybody with a modest sum to invest could buy a printing press and make newspapers. The trick was getting people to buy them. The modern American newspaper took its familiar form during the Gilded Age. To capitalize on those who valued Sunday leisure time, the Sunday newspaper was expanded and divided into supplements. The subscription of women was courted for the first time by including fashion and beauty tips. For Americans who followed the emerging professional sports scene, a sports page was added. "Dorothea Dix," actually Elizabeth Gilmer, became the nation's first advice columnist for the New Orleans Picayune in 1896. To appeal to those completely disinterested in politics and world events, Charles Dana of the >New York Sun invented the human-interest story. These articles often retold a heart-warming everyday event like it was national news. The competition was fierce, especially in New York. The two titans of American publishing were Joseph Pulitzer of the New York World and William Randolph Hearst of the New York Journal. These men stopped at nothing to increase their readership. If a news story was too boring, why not twist the facts to make it more interesting? If the truth was too bland, why not spice it up with some innocent fiction? If all else failed, the printer could always increase the size of the headlines to make a story seem more important. This kind of sensationalism was denounced by veteran members of the press corps. Labeled yellow journalism by its critics, this practice was prevalent in late-19th century news. At its most harmless, it bent reality to add a little extra excitement to everyday life. At its most dangerous, it fired up public opinion to start a war with Spain. Nevertheless, as a business strategy, it worked. Pulitzer increased the daily circulation of the Journal from 20,000 to 100,000 in one year. By 1900, it had increased to over a million. The print revolution affected books and magazines as well. The total number of books in print increased fourfold from 1880 to 1917. Magazines such as the Saturday Evening Post and Ladies' Home Journal reached a broader audience than any previous magazine. 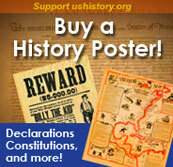 America was becoming more populous, more literate, and, as a result of the print revolution, better informed. A brief sketch of journalist and advice columnist Elizabeth Meriwether Gilmer, who wrote under the name Dorothy Dix, with a link to one of her columns. From Austin Peay State University in Tennessee. This brief biography of newspaper publishing giant Joseph Pulitzer includes information about the Pulitzer Prizes. This detailed essay explains the how the linotype machine worked to revolutionize the printing industry in the late 1800s. Also offers biographical information about its inventor, German immigrant Ottmar Mergenthaler. James Gordon Bennett started the New York Herald in 1832 with $500. Horace Greeley, who started the New York Tribune in 1841, got into the newspaper business with only $10.